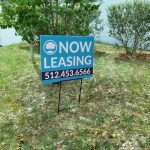 Saber Sign Solutions is your Austin outdoor sign company, providing every outdoor sign your business needs. 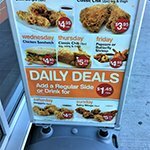 This includes everything from banners, building signs, yard signs and any other exterior sign you can think of for your business, either for business identification, product or service promotion, or for brand reinforcement. Since your outdoor signs are such an important part of converting new eyes into new customers, you need to ensure they are of the highest quality. 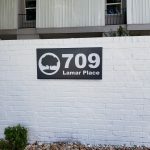 We are your Austin high-quality sign providers. 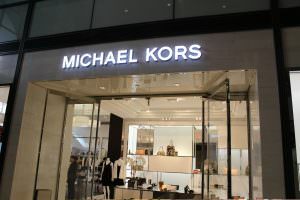 It is not enough to put your name and service at the front of your store, these days you need to show off your unique brand and ensure that customers have a real sense of what your company is about. 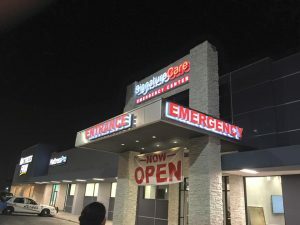 Whether you utilize channel letters, dimensional letters, or an outdoor digital sign, Saber Sign Solutions is a local partner you can always rely on for high-impact, high-results signage. Call Saber Sign Solutions at (512) 861-2699 for a Free Consultation with an Outdoor Sign Expert! 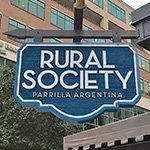 Not every type of storefront building sign is right for your business, the one you choose should reflect your service, industry, and brand personality. 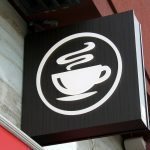 We know that every business has unique signage needs, and we are mindful that your business location, brand persona, time schedule, and budget will be important in your final sign selection. 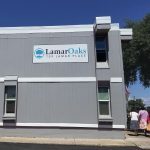 The way your business looks on the outside determines how many people come inside so it is imperative that your signage is attractive and alluring. Your sign must reflect the message you want your brand to convey in order for you to attract your ideal customers. By far the most popular building sign request we get is for storefront channel letters and dimensional letters. These are created through very intricate cut metal segments. These can be in the form of letters, numbers, images, and even symbols. Ours are always aligned to perfection and are secured to a top of the range backing frame. This is where your branding can really stand out from the crowd. This is also where we can be creative, we can put your logo and slogan on the backing frame but also play around with the size, font, and style. Channel letters are often used by office buildings, retailers, grocery stores, shopping centers and malls, churches and schools, as well as professional organizations. Another great way of standing out from the crowd this is one of the most unique outdoor signs available. 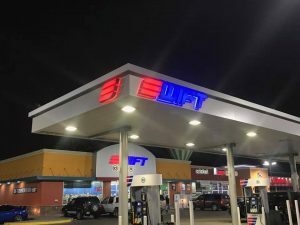 We are able to add custom LED illumination or backlighting to your business sign in a variety of colors and methods, allowing your business to stand out any time of the day or night, and in any weather conditions. Because we deal with experts in lighting, the installation is completely safe and all the relevant electrical elements are as well. This is the only way you can be fully reassured of the quality of your sign in all conditions. 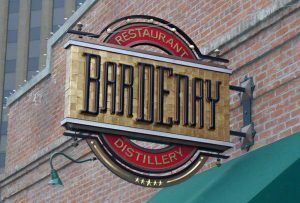 Illuminated signs are very popular with businesses that are open later in the day including theaters, restaurants, nightclubs, bars, convenience stores, coffee shops as well as gas stations. These are some of the most visually appealing signs you can choose for your company, but are best suited to specific types of businesses. It certainly is a unique way of displaying your brand but is also very functional as it protects customers from adverse weather conditions. 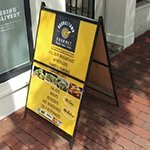 Made from various materials, awning signs are typically stretched across a specific area of your business, such as your front doors, windows, unloading/loading areas, service areas, or even valet stands to provide weather protection. 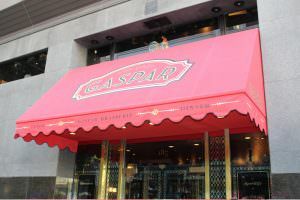 Branding can be accomplished in a variety of ways, from printing directly on a canvas awning to lighted channel letters affixed to a metal canopy. 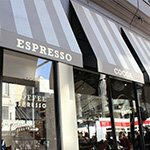 Providing an intimate feel, awning signs are popular for specialist shops, jewelers, salons, and galleries. Gas stations, hotels, and restaurants can also benefit from the protection these signs provide your patrons. 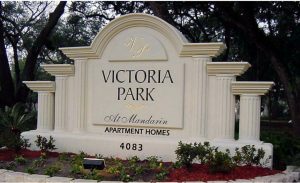 Monument signs are unique and custom-made signage that reflects the durability and permanence of your brand. 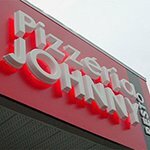 Made of long-lasting materials including marble, stone and even brick, a monument sign becomes the focal point at the entrance of a business. Monument signs are meant to give off a real air of quality that is synonymous with your business. 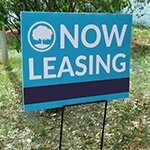 These signs have a significant presence, telling your potential customers, investors, guests, and employees that your business is in it for the long haul. 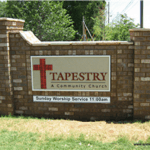 A prestigious sign that is most often found to frequent the entrance of a school, university, manufacturing plant, church, private club, and corporate offices, monument signs make a big impression! Stand out by standing tall with one of the most modern methods of signage for demanding attention. 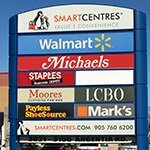 Pole signs are great at grabbing the attention of customers, even from a distance, while pylon and tenant signs help to give a quick run through of what businesses to expect at a mall, shopping center, or business park. Pole and pylon signs have the ability to divert the passing eyes of many people all at once due to their can’t-be-missed size. 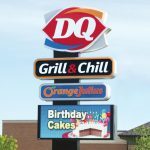 Pole signs are especially popular for those who are looking to attract customers from busy roadways such as interstates and highways to their convenience items, such as gas, food, or supplies. 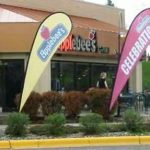 Pole signs are often used by gas stations, malls and shopping centers, fast food restaurants, and other areas frequented by a lot of traffic. It doesn’t matter how big or small your requirements are, we have all of your outdoor signage needs covered. Due to our years of experience, we already have everything needed to deliver outstanding signage, from the resources and tools to the expert staff to make the ideal sign for your business. 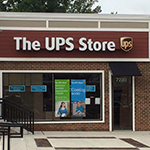 Complement a storefront sign with custom indoor signage to give your business maximum exposure. Saber Sign Solutions will support you throughout your signage project. Exterior signage is just one of our areas of expertise, we also offer coherent and attractive interior signs to match! Saber Sign Solutions offers everything you could want for your outdoor signage needs. We care about each project as though it is our own business we are promoting, and take a very active approach to your design. 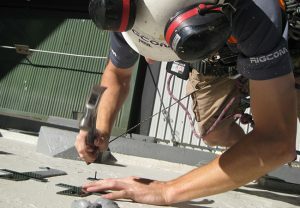 We will be extremely communicative throughout the whole process to ensure all your needs are met, from your initial consultation through installation. We can provide all of the staff to take your design from an initial idea to the final product, so there is no need to hire a separate sign designer. We create everything from the perfect design to the right file type in the optimal sizes for printing with our equipment. 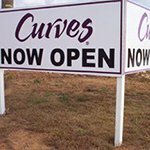 We design outdoor banners, real estate signs, lighted signs, window signs, door signs, and any type of outdoor sign you can think of. We believe in using local services, which is why our sign production facility is located in Austin. You will get the true Austin service and quality in your end product. 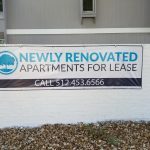 We also have everything we need to install your outdoor banner and if any permits are required then we can even handle that as well. Our expert team of sign installers are at your disposal. We use the very best trained staff to get the job done in a professional and timely manner. 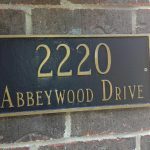 We are fully aware that your sign will last a lot longer if installed properly, and that is exactly what our expert sign installers do for you. 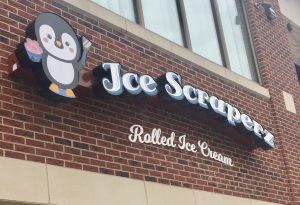 Saber Sign Solutions creates attractive, high-quality outdoor signage that reflects your brand, attracts more customers, and helps you accomplish your business goals. A quality exterior sign is an opportunity for you to show the world everything it needs to know about your business. 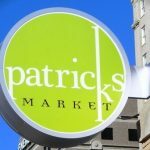 From storefront signs to promotional signage, Saber Sign Solutions is your full-service partner for all of your Austin signage needs. 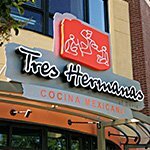 We look forward to working with you as your long-term signage provider, creating cohesive, brand-reflective signage that looks fantastic, fits your needs, and meets your budget. Call Saber Sign Solutions at (512) 861-2699 for a Free Consultation with an Exterior Sign Specialist!